Occasionally a good challenge comes up that’s just too darn good to pass up. Here’s the deal. My boss’s boss’s boss issued a challenge to me and my team: get 10,000 Twitter followers on the @NaxosRecords account by the end of March. Will we stick it to the man? Can we do it? I think so. The intent is obviously the more people we have in our community, the higher the raw numbers of click-throughs and retweets become. Right now, we average about a 7% click-through rate and a 12% retweet rate, with roughly 3300 followers. I’d love to see all 3 numbers increase! Thankfully, the challenge is just to get our numbers up, and not interactions. 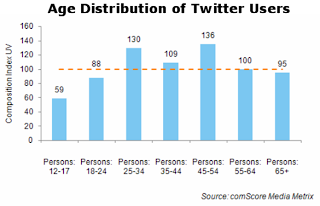 One of the great things about Twitter is that the average age of Twitter users falls in the 25-54 range (marketingcharts.com, 04/2009), which is our target audience. It stands to reason that there are at least 10,000 classical music fans in the Twittersphere. The big key is how to motivate them to follow us. This probably needs a separate post, but Janet and I recently attended SocialFresh, a great conference for social media geeks. Definitely check it out – the guy that runs it is a BAMF and deserves mad kudos for putting it all together. Anyway, Paula Berg (@PaulaBerg) formerly of Southwest Airlines, gave an incredible talk about the power of social media, specifically Twitter, to help propel @SouthwestAir into 2 of the largest grossing days of sales in the history of SWA in 2009. It took her from the beginning of 2007 to 2009 to connect with over 1M Twitter fans with her team. Those two years focused on bringing the employees passion and love for SWA to Twitter, building trust, and adding value to the Twitter community. Her team tweeted about everything from delays, weather, and news, to funny/inspiring stories about SWA, passenger’s pictures and videos, and crazy tales from employees. It was and continues to be a pretty solid mix of corporate/business information and feel-good human stories. I bring this up because this is the ultimate test of whether or not social media marketing will have longevity with companies: ROI. At the end of the day, we are all in business to inspire people to spend their money with us. If we can’t prove ROI with our social media efforts, then what the hell are we doing? This entry was posted on Friday, January 15th, 2010 at 2:10 am	and is filed under Classical, goals, Music, social media, Social Networks, Twitter, writing. You can follow any responses to this entry through the RSS 2.0 feed. You can leave a response, or trackback from your own site. a wise man (@JasonFalls) once said "Stop selling, and help people to buy."